What happens is that some videos can not be downloaded. When videos can be downloaded, image 1 will appear. 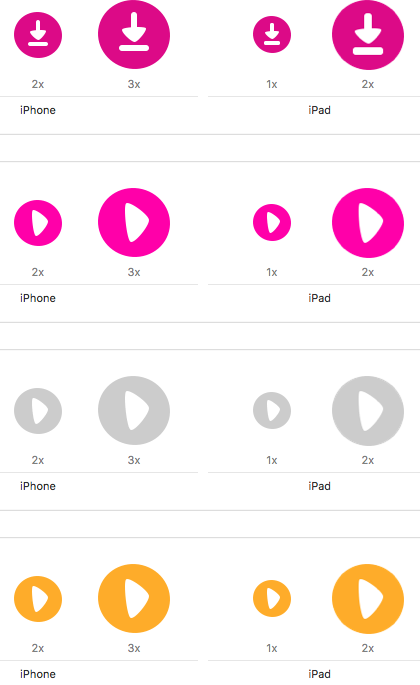 When the videos have been downloaded and saved, the "Play" button has the fuchsia / pink color as picture number 2. The gray "Play" button appears when the video is streaming and there is no Internet connection to watch them at the moment, as in picture 3. If the "Play" button is yellow, the videos are streaming and the internet is available to watch them at the moment. In other words, the streaming videos you can watch the video, but do not download it and save it into your device.